Like to hike? Then imagine hiking alongside Jupiter or Apollo, literally in the clouds, gazing down upon the seemingly endless Amalfi coast of Italy. The air is misty, and you can smell just a hint of the briny Mediterranean Sea, which is true-blue and placid in the distance. Here are five hikes not to miss along the Amalfi coast! 1. There is no better view of the spectacular craggy coastline and the majestic Mediterranean Sea than from the top of Monte Tre Calli. You can do this hike in two ways. A lower, circular route takes you from Agerola or Bomerano along a paved road to where the road ends. From here you will see a spectacular view of hidden Positano and the “rich and famous” isle of Capri off in the distance. The second route takes you directly up the mountain to the pinnacle of the mount and is a more strenuous hike, but truly rewarding. 2. The well-known Path of the Gods hike starts the same way as the Monte Tre Calli hike. This hike combines walking with mountain climbing, goat dodging, and gob-smacking vista gazing. You’ll likely meet local shepherds, walk past ancient stone houses carved deep into cliffs, and view umbrella-like Italian Stone Pine trees. You can continue to Positano or circle back to the beginning depending on your time and wishes. 3. 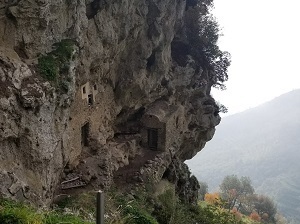 Hike down, down, down from Agerola/Bomerano to Amalfi on old mule paths and steps, more than 2,000 of them! 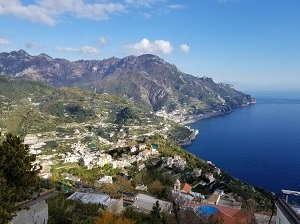 This hike takes you through gorges, around the mountains, then down to the sea at Amalfi. Along the way you will find spectacular views, including the “diving bridge” at Furore, where the Mediterranean High Diving Championship takes place every July. Go at your own pace and enjoy the landscape. 4. Reverse the prior hike going up, up, up from Amalfi to Ravello through a beautiful forest that passes through the old village of Pontone. Breathe in the fragrant lemon trees lining the beginning of the stepped path, which passes by historic former paper factories. Arriving in Ravello is a revelation. The views from here are idyllic and the town is known for both summer music festivals and cats. Check out the lush gardens at both Villa Rufolo and Villa Cimbrone. Rufolo has Moorish architecture, while Cimbrone has an infinity terrace that will blow your mind! 5. While outside of the Amalfi coast proper, one of the most impressive of hikes is up along the crater of Mount Vesuvius, which offers 360-degree views of Naples and the surrounding areas. Here, you can immerse yourself in history, archeology, and nature during your hike. 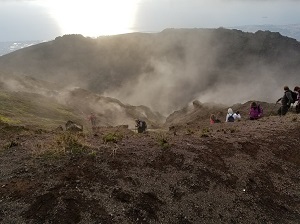 The crater is sending out smoke and steam even today, so you can imagine what must have happened centuries ago during the eruption in 79 A.D. that buried Pompeii and Herculaneum. Visit these two ancient buried cities to expand your imagination even more.